I've been working on the onboarding/registration section of my product for some time now. We've managed to reduce the form to only one text field. Users register via social login (traditional login currently being developed) and after that the only requirement is a group name. See image below. UX goals for registration/form is always to make it easy, intuitive and short (See here, here and here. However, can registration/forms be too easy? I can imagine users might have trust issues ("This can't be just it. Must be fake") or judge the product as broken or unprofessional with very easy forms. To clarify; when someone logs in, creating a group is a requirement. Traditional login is something that's currently in development. In the general case, the fewer forms you have the higher the conversion rate. However, if the form lacks important information for the users, like trust signals or other specific info, your completion rate will drop. One thing at a time is much easier for the brain to process. "Two stimuli therfore achieve worse results than just one. It seems contrary to common sense, but we believe that the reason for it is that the brain wants to save energy,"
That's why when we are presented with one complex and one simple task most of the times we prefer to do the simple one. That's because our brain is constantly trying to save precious energy. In our case if we have two forms we should process twice as much information as with one form. On a low processing level the brain will prefer to process one stimulus instead of more. Our brain likes simple stuff. There are a number of studies exploring this question. You can search google with this query for more. 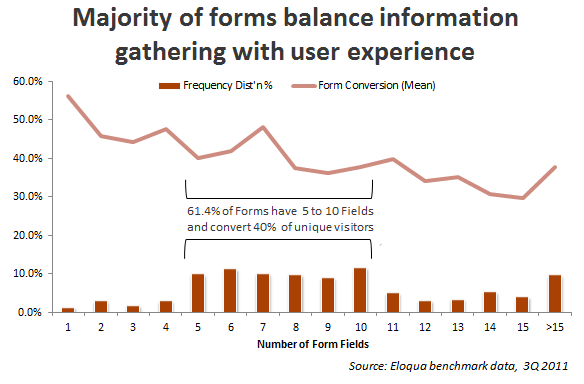 In general, the fewer forms you have, the higher your conversion rate. As you can see from the articles that you've linked, they all advise reducing the number of registration form fields. However, other study by vwo found that removing too much information from the form might yield a lower conversion rate. In one of the variants they stripped down a 3 form field and got 10% better conversion rate than the control version. However, when they trimmed more forms and removed navigation they got only 2.78% better conversion rate than the control. Because your interface is different than those in the studies above your results will be different. You should test what happens in your specific case. The result from the last study shows that sometimes you might trim valuable information that users need. Therefore, you should test if your form lacks some information that's crucial to users. If you can attach conversion rate tracking to the form, then create different variations and compare them using A/B testing: you will receive valid, objective data. User tests will also help a lot in answering your question. A form can absolutely be too easy to complete. Some decisions need to be slowed down rather than expedited. One example might be a modal that reads, "click here to give your no-account Brother-in-law power of attorney." LinkedIn got themselves a class action suit for making it so easy to spam everyone on your address list that many people didn't even realize they were doing that before clicking "OK." Don't be that site. There’s a widely agreed-upon guideline to “Remove fields which collect information that can be (a) derived in some other way, (b) collected more conveniently at a later date, or (c) simply omitted“ from registration forms. But there is at least one big exception to this rule: the name field. Your system probably doesn’t require a name to complete a registration. Just for example, an email address - which the Marketing Department probably craves - is much better to uniquely identify a user. Depending on your situation, there may be other information to ask for on your registration page, simply because it is polite or appropriate to do so. A common dark pattern is what might be called the "preamble" form, a bait-and-switch single field UX glory which when submitted reveals all the form fields the business "couldn't do without." This is an instance where adding a sprinkle of good UX actually makes the total experience worse - rather than a single form which accurately reflects the work required to get something done, the user is tricked into a sunk cost situation where they are likely to be swearing as they complete the full form. Can something like a form or subscription be too easy? Sure. There are many ways in which a form can be too easy. One of the most common dark patterns is the opt-out function for mailing lists. There are many things that require interjection for security purposes. A recent project of mine had a bunch of people submit the same street name as the city name, likely due to autofill scripts. And if you receive a lot of reactions/subscriptions, you might want to raise the bar a bit to trade quantity for quality. Can a simple form turn away users? Yes. You already mentioned it feeling too cheap or unreliable. People can interpret it as an underdeveloped site/app, or they can fear a long list of individual pages with a single form field. They might also be annoyed that you couldn't ask this before the social-login stage; it's not like this question is context sensitive based on their account or you're pulling any info from the social link. make a single-page signup. If it's just one or two required fieldd, put that on the page with the social login underneath. This removes a step, making the signup faster for the user and slightly decreases the performance costs for your server, and it gives more transparency. add optional information to the form. Want a group icon? Pull in some contacts? Select a theme? You can but you're not forced too. This will make the app feel more developed while simultaneously appearing to demand less of you. Personally I'd go for a combination of both; move the required fields to the social-login page, and have it followed by an optional step. This gives great transparency of required info, makes the required/optional split much more clear, and shows the quality of choice while still allowing for a quick start. I think the implication of "Complete Form" might indeed give the impression that they missed a step or that this is a broken form. Contextually, the user is not completing a "form" per se rather than she chooses a group name. Changing the writing on that button to be something closer to "Create group" or "Start -action-" might diminish those uneasy feeling to your users. And no, a form can never be too simplistic but in the end it all has to do with your delivery, branding and tone of voice. You scenario sounds like an occasion where perceived friction could affect the user's perception of a product. Sometimes more friction can work in your favour, for example a banking transaction where you have to reenter your password even though you're logged in; extra friction increases the feeling of security. However, in most cases more friction leads to more effort and more pain and in your particular example, the less work needed by the user, the better. But like I say, if you're not sure, test. It depends on what your product is offering and what the user expects. For example if I would use the app to discuss topics with other people, I might expect to enter at least a username or else get worried because I'm not sure if it will display my full name and I might want to avoid this. You could avoid this by informational copy text that clears any confusion for the user. But no, I don't think a registration can be too easy. The applications with the best UX have registrations that are as simple and fast as possible. If more data is needed, those applications gather them after the user made his registration and started using the app in a really subtle way. As a rule, a form can never be too easy but it depends on the target user. Social login is so typical nowadays, that people are used to just using that upon registering (and most of them are pretty happy about it, well if we exclude the part where in some cases of FB social login, user must give permission for the page to enter his FB profile info etc etc, which creates anxiety to the user and is a major break point for many products). But again, it depends on the user, the registration you describe is the same that ux.stackexchange uses, i doubt that any of the (tech savvy, web freaks, ux passionate) users here felt unsure or had trust issues. And of course, the best way to find out what your users really think... test , test, test. Many times, a form's goal isn't to gather as many submissions as possible, but to gather as many highly-qualified leads as you are able to handle. 1. You are receiving fewer leads than you can process. Action: Remove a field, stop requiring an existing field, or otherwise work on making the form easier to fill out in order to increase the volume of leads you're generating. 2. You are receiving more leads than you can handle. Action: Add a field, start requiring an existing field, or otherwise increase what you're asking of your visitors in order to reduce the number of leads you generate while, at the same time, increasing the quality of those leads. The reality is, the more your user has to invest in filling out your form, the more invested they are in what you're offering before you even know they exist. The flip-side is that asking for more up-front investment often reduces the number of leads you generate. This is a useful trade-off, and one that you can use to your advantage. An anecdote that slightly relates: I've noticed when visibly building a report on the screen for a user that there is a 'sweet spot' that is more impressive. I suspect a similar phenomenon applies here. Too little efficiency is obviously bad, but too much efficiency also gives the impression that little has actually been accomplished. But if the process is more complex than it seems, maybe that complexity can be demonstrated or conveyed to the user to indicate that, yes, something more complex than you might otherwise think is taking place here. Monitoring your signup process Using tools like MouseFlow or HotJar to monitor the form users. Make CTA button stand out The color of your CTA button has a major impact on conversion rate. Think of the button design/color as a visual cue that helps your prospects find the button. In other words it answers the question, "Where should I click?" 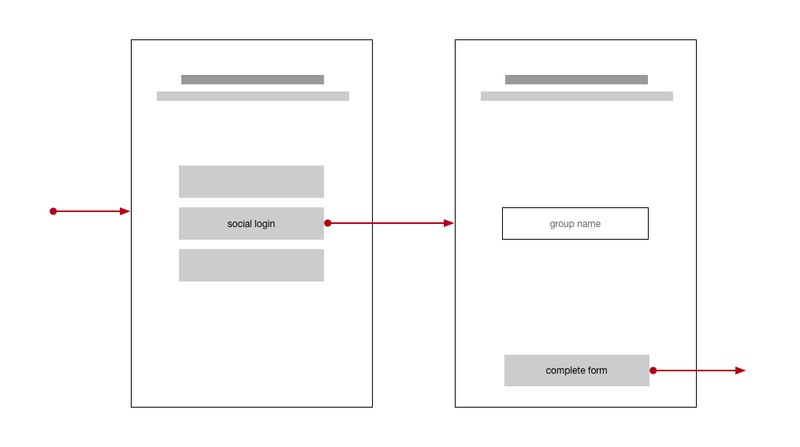 If you want to find out more about how to optimize registration forms, check out this blogpost. Not the answer you're looking for? Browse other questions tagged forms registration or ask your own question. Should I remove “Name” field in my newsletter sign up form? Show approximate time to complete on a form? Can a contact form be too short?